Kituo cha Sheria joined the world in commemorating the Katiba Day on 27th August 2014. The event was aimed at celebrating the gains we have after 4 years of promulgating the constitution as well as strengthening the gaps in realization of devolution gains. The event was held at Kangemi on 27th August 2014. The people of Kenya through a referendum adopted the new Constitutional order promulgated on the 27th August 2010 at Uhuru Park, Nairobi. The supreme law envisaged a new political, cultural and socio-economic era where the aspirations of the Kenyan people for a government that promotes the rule of law, respects human rights, equality and democracy as necessary tools for development. In exercising this authority, every citizen and every person irrespective of tribe, race, religion, and status has an obligation in respecting the Constitution and actively participating in its implementation and enjoying the gains. The question we grapple with is, if this has been the case and if not, how we can strengthen the grey areas as community and civil society actively engaged in the process of implementing the constitution and enjoying the gains. The guests who included Kituo cha Sheria Executive Director, Gertrude Angote, Mercy Wambua from Law Society of Kenya, area chiefs and assistant county commissioner, acknowledged the fact that the period has not been all rosy. There has been ups and downs and there was need to sit together as Kenyans and see where we have failed and seek the necessary remedies. Were keen to address the gains and the challenges we have faced in the period through which we have promulgated the constitution. There has been various emerging issues and concerns especially on the pending legislation on land and evictions and resettlements bills before the parliament. For the four year’s period, the public have become more aware of their duties something that has increased interaction between policy makers and the public. The public have been equipped with knowledge on their participatory roles as well as oversight not only at the county level but also nationally. Kenya must never forget the 28th of February, 2008. This day marked the signing of the National Peace Accord to end the 2007/2008 post -election violence. It was noted that this was a new chapter for the country, to begin the peace process. The establishment of the Truth, Justice and Reconciliation Commission was part of this package deal. The Truth Justice and Reconciliation Act of 2008 (TJR Act) was enacted by parliament following the post -election violence and was aimed at addressing the gross human rights violations that had occurred from independence to the 2007/2008 electoral violence. It was envisaged that in addressing these violations, Kenya would promote peace, justice, national unity, healing and reconciliation. It must not be forgotten that it took tremendous courage for victims to testify and give their narratives for the first time, to a truth commission. Given the amount of time, tax-payer’s money and personal investment dedicated to this process, the TJRC report must be upheld and protected; implementation of the Commission’s recommendations should commence without further delay. The Truth, Justice and Reconciliation Amendment Act of 2013 (TJR Amendment Act) seeks to undermine the work of the TJRC. We call upon Kenyans to take note that The TJR Amendment Act gives power to parliament to alter the recommendations of the TJRC report. Prior to the amendment, it was envisaged that the implementation process of the TJRC report would be done in accordance with the recommendations of the Commission. In the TJR Amendment Act, the implementation of the TJRC report will be done in accordance with recommendation of the National Assembly, upon ‘consideration’ of the report by the National Assembly. The TJR Amendment Act affects the very provisions on the implementation of the recommendations. In consequence, the TJR-Amendment Act amounts to an amendment of the report itself. That the National Assembly will alter the TJRC report under its consideration seems very likely. The MPs’ ignored the provision by the Justice and Legal Affairs Committee prohibiting any amendments to the TJRC report. It goes without saying that the country will witness the expunging of names recommended for prosecution to protect those in power or allies of those in power, the editing of certain sections to suit the interests of those incriminated, a distortion of the narratives of victims and finally a watered down, politically correct document. This will be a blatant and outright violation of the right to truth. Article 35 of the constitution provides for the right to information. All citizens are endowed with this right. In the wordings of Article 35 (1) (a), (b) and (3), the state and any person holding information has an obligation to publish and publicise it. Whether for the exercise or protection of a right or fundamental freedom, or by fact that such information affects the nation. Article 19 of the constitution provides that rights, including the right to information and inferred from that, the right to truth, belong to each individual. Thus these rights are not granted by the State, but rather accrue to all human beings. Further, Article 19 (3) (b) provides that the rights and fundamental freedoms do not exclude other rights. And if there are such rights recognized or conferred by law, their applicability is welcome. The right to truth recognized internationally and applicable in Kenya vide Article 2 (5) of the Constitution – which shall be detailed herein below- is such a right. National values and principles of governance as enshrined in Article 10 bind all State Officers, organs, public officers and all persons. The National Assembly is one such organ and/or person(s) bound by these values and principles whenever it – Article 10 (1) (b) – ‘enacts, applies or interprets any law.’ The values and principles include but not limited to, (2); the rule of law, democracy, human rights, transparency, and good governance. The National Assembly is bound to act within the Constitution and other provisions of the law. The findings of the Commission have to be held – by state organs and any persons – within the national values and principles of governance. This is the only way that people can access their right to information. True information. According the TJR Act, one of the objectives of the Commission is to promote peace, justice, national unity, healing and reconciliation. The Commission must inter alia; establish an accurate, complete and historical record of human rights and economic violations and abuses. The establishment of truth commissions all over the globe and their objective and mandates to enhance democratic developments with regard to reconciliation and the rule of law in the aftermath of conflict and massive human rights abuses indicate that the right to truth is an internationally accepted principle. The legal acts forming the basis for truth commissions, like the TJR Act, ground themselves on the individual component of victims’ needs and right to know about the context of their suffering and a collective component, recognizing the need of the society as a whole to understand the roots and causes of violence that had taken place in their midst in order to facilitate the reconciliation process, to contribute to the fight against impunity and to reinstall and strengthen democracy and the rule of law. The same applies to the TJR Act. According to the constitution, human rights embodied in the Bill of Rights are an integral part of Kenya´s democratic state and the purpose of protecting human rights is to preserve the dignity of individuals as well as communities (Art.19 (1)(2)). Furthermore, according to Art. 48, the state shall ensure access to justice for all persons and Art.10 provides that the rule of law, democracy and participation, human dignity and human rights, transparency and accountability are national values and principles of governance, binding all state organs. The internationally emphasised right to truth is derived from all these principles. In acknowledging the foregoing principles and rights in its constitution and in its TJR-Act, Kenyan state organs are bound by the right to truth. In conclusion, the spirit of the TJR Act and the Constitution embrace the right to truth for victims of human rights violations in Kenya and thus it indicates that Kenya adheres to an internationally accepted right to truth in the context of transitional justice mechanisms – especially truth commission. An argument alleged by members of the National Assembly was that persons implicated in the TJRC report were not appropriately heard before the commission. According to the TJRC report, all individuals who had been found responsible, were given an adequate opportunity to respond. The findings against individuals and groups were made on the basis of the balance of probabilities standard of proof. Given that the implication of a potential perpetrator does not equal a verdict of guilt, delivered by a criminal court, the standard of proof might be lower with regard to truth commission reports which follow a different purpose concerning the truth. The rights of the implicated persons were therefore not violated since they had the opportunity to be heard before the commission and/or to submit documents. Consequently, this argument does not justify an amendment of the TJRC report. In conclusion the TJR Amendment Act violates the right to truth under the Kenyan Constitution and international law. At every dawn, Mr. Stephen wakes up and wonders whether his life will be the same as it was prior the 2007 ENP. Although he has tried to bury the hatchet and call it a past tense, the fateful events keeps on unfolding in his mind. generally, this is the same life that majority of IDPs have been living with since then hoping that one day, someone will come from heaven for help; they have been living with superficial expectations. It is a shocking realization that IDPs are still existing in country hitherto. This was evident during the IPDs leaders training last at Ngong Hills Hotel. Before then, I used to think that all IDPs were resettled. However, we still have IDPs in Rift Valley, Western, Nyanza and Coastal region. Most of them have gone into a state of desperation as they live in deplorable conditions. The high expectations that they have holding for years has contributed to their misery. They are hoping that when justice is ultimately realized, one day, they will regain their houses, their relatives and properties that got lost. It is in this light that Kituo saw it important to inform them that it is important to manage their expectations. During the training, Verena, a trainer with giz did not hold back while informing them that it is important if they learn to manage their expectations and move forward. ICC nor any court in Kenya will put food on their table. Notably, majority of the IPDs have failed to progress due to various promises given to them every day by people, organizations and even the government that they will be compensated. In fact, some go a step higher to exploit them or benefit by misusing them. This has been a worrying trend that has kept them dependent on a “helping hand.” Politicians have also been misusing the youth among the IDPs communities turning them into beggars. In this regard, the leaders were told empower and encourage the youth to take advantage of county governments and funds available to start income generating activities. During the training, the IDP leaders were informed that even if the ICC cases that are much looked at turns out positive and justice is availed, it does not mean that they will regain the status they had before. Therefore, it is important for them to learn to move on with their life. The IPD leaders were taught how to distinguish between their needs, interests and position. In fact, Jodom Mwebi from Kituo did not mince his words as he told them that some people claim that they want justice while in real sense they mean food, clothing and other basic needs. Thus, even if they want justice served, they should first find ways to meet their basic needs. The IDPs leaders were also asked to encourage their people to take advantage Trust fund, Ability, loans, grants from the government and other organizations and initiate development activities as groups. Moreover, they were told to take advantage of county government budgetary allocations and present their needs at that level where they are likely to get funding. This will play a vital role in ending the dependency syndrome among them. 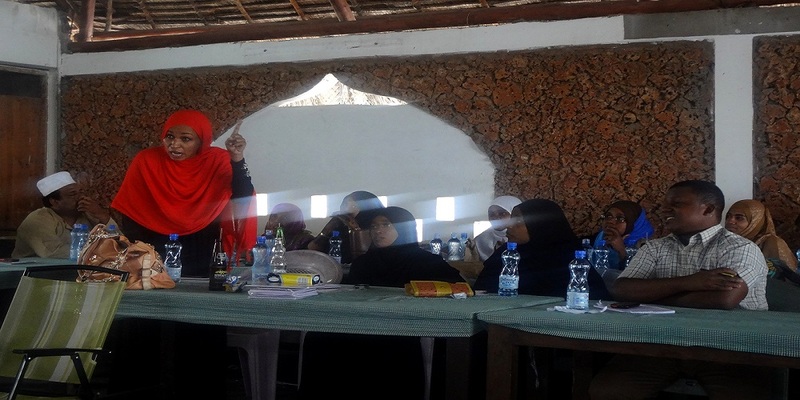 The training also acted as a platform where leaders shared their experiences and success among their communities. For instance, in his area, Mr Gregory has successfully started self-help groups that are doing great. On the contrary, some expressed their frustration in the way their groups were folding up while they were just flourishing. Therefore, they had to learn some tactics of how to manage such groups such as ensuring that there is no personal ownership of a group, money should not be kept by an individual in his house among others. With this, majority of them were satisfied that they were ready to go and change how things were among their people; they will be able to handle the matters of their people in a more advanced manner. KITUO Forced Migration Programme (FMP) held a Police Consultative Forum on 20th March 2014 to discuss the question of refugee protection vis a vis the question of national security and how to reach a balance between the two. The event was held at Nomad Hotel in Eastleigh. The event was graced by various police heads; OCSs and OCPDs from Central, Kamkunji, Comfortable, Harvest, Shauri Moyo and Industrial Area. The Member of Parliament for Kamukunji, Yusuf Hassan was also present. Speaking during the event, She. Yusuf Hassan expressed his concern over the increased state of insecurity and urged the police heads to work to see that the situation is addressed especially within Eastleigh. He acknowledged the fact East Leigh is one of the terrorist hotspot that had been on the limelight for breading terrorism in the country. However, he was quick to state that not all refugees of Somali refugees are linked with terrorism. Citing countries such as Ethiopia that has a large number of Somali refugees but has few instances of terrorism, he argued those present that something need to be done in addressing the question of insecurity. He questioned the legality of some refugees who are allowed to come into the city from the camps without being able to sustain themselves economically because they end up being used to terrorize people. Linet Opiyo from UNHCR, addressed the issue of refugee protection within Nairobi and its environs. She expressed her fear over the government’s closure of the registration programme of refugees. She pointed out that documentation of refugees had been an issue that has not been addressed. This is because refugees have different registration documents having diverse format something that makes the work of police more complicated because they do not know which document to check and which one is valid.